In this lesson, we will look at dividing a decimal number by a whole number and dividing a decimal number by multiples of 10. Place the decimal point of the quotient (answer) directly above the decimal point of the dividend. 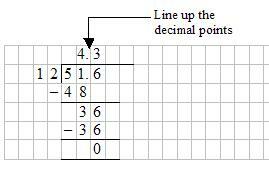 The following video shows how to divide a decimal number by a whole number.